FOR IMMEDIATE RELEASE: The latest technology in solar thermal hot water flat plates is officially on the market. Today, the Solar Rating and Certification Corporation (SRCC), awarded SunMaxx Solar’s TitanPower ALDH29 the OG-100 Certification. According to the SRCC, “the OG-100 collector certification program applies to that part of a solar energy system that is exposed to the sun and collects the sun’s heat.” The independent third-party non-profit conducted numerous durability tests for the certification. During these tests, they measured the collector’s energy output performance. 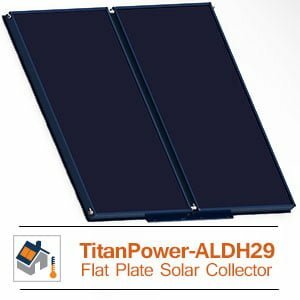 In Climate Category C (36 F), the TitanPower ALDH29’s output reaches an unbelievable 31.2 kBtu rating. The Y Intercept rating is 0.739 with a slope of -0.702 Btu/hr.ft2.°F. SunMaxx Solar designed these flat plates to connect to one another with connector brackets instead of the traditional mounting rail. As a result, the installation cost and time is dramatically reducing. Aesthetically, the plates give the “skylight” look more than any other solar panel on the market.